Nurses rallied near Partners HealthCare in Somerville in August. In a 30-second television advertisement airing across Massachusetts, a nurse looks toward the camera and declares that government-mandated restrictions on nurses’ caseloads would put hospital patients at risk. In another ad, a parade of nurses argues just the opposite. “Patient limits mean more time with your nurse and better care for you,” one says. The two factions warring over ballot Question 1, a measure that seeks to regulate nurse staffing in hospitals, have both released ads — and both are using nurses in scrubs to argue their case. Their ads may appear similar, but their messages are vastly different, part of the escalating rhetoric in the leadup to the Nov. 6 election. 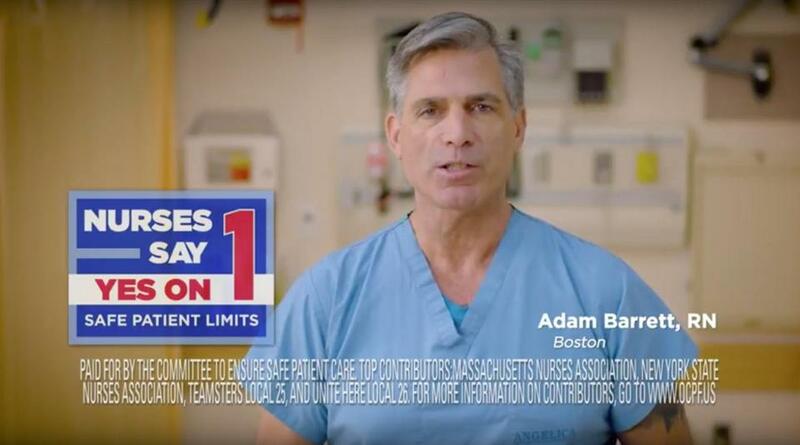 A coalition backed by the Massachusetts hospital industry launched the first ad, which warns that the ballot question could have damaging effects on health care delivery statewide. Hospitals say staffing regulations would be extraordinarily costly. 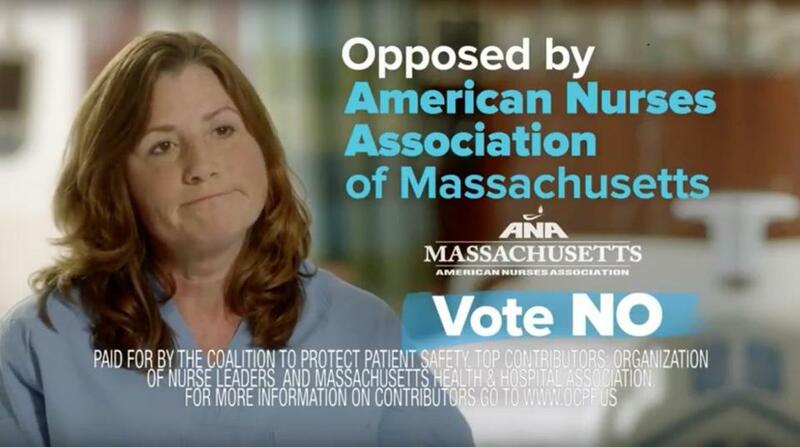 The Massachusetts Nurses Association, a labor union that sponsored the ballot question, is behind the second ad, which states that the policy is supported by most nurses and would improve patient safety. Adding to the confusion, the two groups have similar-sounding names. Last summer, the nurses union branded its ballot effort as the Committee to Ensure Safe Patient Care. Hospitals followed by calling their group the Coalition to Protect Patient Safety. Screenshot from an ad from the Coalition to Protect Patient Safety, which is backed by the Massachusetts Health & Hospital Association. In addition to the TV spots, both groups are promoting their messages via similar-looking websites, social media accounts, and lawn signs in hues of red, white, and blue. The union’s Twitter handle is @PatientSafetyMA. The opponents are @MAPatientSafety. The ballot question would set strict limits on the number of patients assigned to each nurse. The limits would range from four patients per nurse to just one or two patients per nurse, depending on how sick the patients are. Hospitals would be penalized up to $25,000 for each violation. The hospital industry’s coalition has already spent millions on advertising, and it plans to continue running ads until Election Day. But because nurses are the ones doing the talking, casual viewers might not realize that the Massachusetts Health & Hospital Association is paying for the ads (unless they pause the video and scan the fine print). These ads more prominently state that the ballot question is opposed by a group called the American Nurses Association of Massachusetts. This is a professional association of nurses with a name that sounds much like the labor union on the other side of the issue, the Massachusetts Nurses Association. Tobe Berkovitz, an advertising professor at Boston University who has worked as a political consultant, said the hospital coalition was smart to use nurses as the face of their argument. Screenshot from an ad from the Committee to Ensure Safe Patient Care, which is backed by the Massachusetts Nurses Association. But union officials say their opponents’ ads are deceptive. Dan Cence, a spokesman for the coalition that opposes Question 1, said the ads are not meant to confuse voters. “Our intention is to educate people, to educate the voters about the dramatic negative effects this ballot question could have,” he said. Cence noted that many groups representing health care professionals are on the same side as the hospitals trying to defeat the ballot initiative. One of the early backers of the effort is the Organization of Nurse Leaders, which represents nurse executives. Union officials, however, say that their campaign more accurately reflects the views of nurses who work at patients’ bedsides. 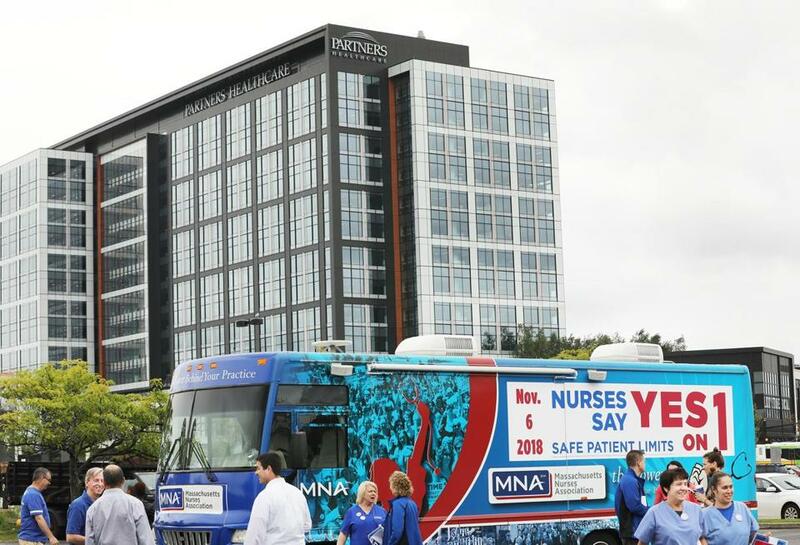 Their new TV ad, launched last week, repeatedly declares that 86 percent of nurses support the ballot question. That figure is based on an April phone survey of randomly selected nurses, union representatives said. About 300 nurses responded to the survey, and of those who responded, 54 percent were not union members, they added. Opponents argue that the survey results are skewed because the survey overrepresents union members. “It’s wrong, it’s irresponsible, and it’s misleading,” Cence said. The union represents about one-quarter of the roughly 100,000 nurses in Massachusetts but its members include nurses at large hospitals like Brigham and Women’s. For two decades, the union has pushed for a nurse staffing law, arguing that care suffers when nurses are overburdened with too many patients at once. California is the only state with mandated nurse-to-patient ratios, though its law is not as strict as the Massachusetts proposal. Union officials estimate the Massachusetts proposal would cost about $47 million to implement. Hospital executives say the measure is too rigid and could cost almost $1 billion a year. They say hospitals would have to close services — including 1,000 beds for psychiatric patients — because they wouldn’t be able to afford the new nurse staffing regulations.